Please read below carefully to decide if a payment plan is right for you! How do SHOW Payment Plans work? + There is no extra charge to set up a Payment Plan. We welcome all clients who would like to use a Payment Plan. To set one up, please contact our office. Contact information is at the bottom of this page. + A Pike 13 account is required to enroll in classes and a payment plan. If you haven't made one already, please create an account with us. + Your Pike 13 account must have a credit card on file. Please add one to your file under Payment Methods. + To do a payment plan, 50% of tuition is required to enroll in a class. The 50% of tuition must be paid before the Spring Session begins (March 25, 2019). + The second half of the class cost will be charged to your card at the halfway point of the Spring Session (May 6, 2019). A date later in the week can be arranged on request. + A digital payment plan contract will be sent to you via Pike 13. The contract must be signed through your account before Spring Session begins (March 25, 2019). Once signed, a copy will be kept on your account for future access. Payment plans will not be confirmed until this document is signed. + Please note: Pike 13 does not keep track of negative account balances. We'll keep track of your account balance at the studio. 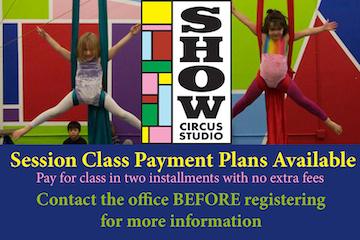 All questions about your balance must be made directly to the office manager at info@showcircusstudio.com. + Payment plans will only be canceled if the studio receives a medical excuse for not being able to attend future classes. Schedule changes, inability to pay, and deciding not to take the class does not release you from the second half of the payment plan. Collection services will be used if necessary. How do Troupe Payment Plans work? We can break up Youth or Adult Troupe payments into 1 or 2 payments per session. This comes out to 3 or 6 payments for the entirety of Troupe. If you do the 1 payment per session plan (3 total payments), you will be charged at the beginning of each session (Fall, Winter, Spring). If you do the 2 payments per session plan (6 total payments), you will be charged at the beginning and midpoint of each session (Fall, Winter, Spring). Where do I get a Payment Plan? A payment plan cannot be set up by the client. It must be set up by SHOW. Email, call, or visit our office to set up a payment plan. All voicemails, phone calls, and emails will be answer during office hours. There are no office hours on Friday and Sunday.